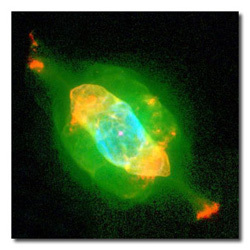 As first appeared in the October 2009 edition of the Syracuse Astronomical Society newsletter The Astronomical Chronicle (PDF). 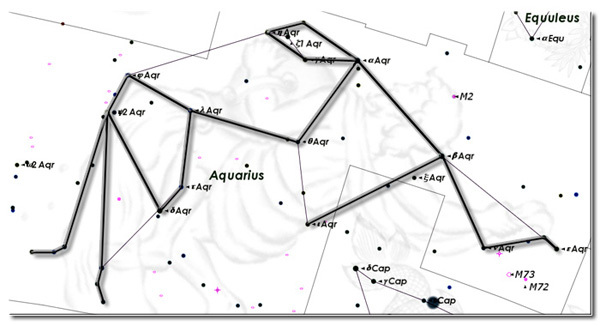 Of all of the Constellations that have taken human forms through history, Aquarius the Water Bearer may have the most varied professional background. His career peaked early in human history, with the Babylonians identifying Aquarius as GU.LA, their identifier for the god Ea, Ea derived from the Sumerian god Enki. 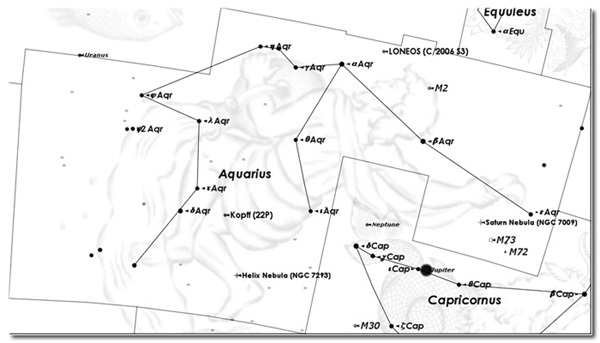 To put that into perspective, the stars of Aquarius have been recognized as a Constellation since, at the very least, 1200 B.C. (the dates of the oldest known Babylonian star catalogues. As these catalogues borrow heavily from Sumerian mythology, we can only assume his actual origins step significantly further back, although records are difficult to come by). His demotion to water bearer comes with his adoption by the Greeks and his inclusion into their mythology, with his aquatic status in Greek mythology traveling, albeit likely by land routes, as far East as India. Then, like a leisure suit-clad Pat Boone on his pre-heavy metal reinvention, Aquarius found considerable recent fame as a disco star. When one starts at the top, it would seem that careers, like water, run downhill (although he may not yet be ready for the Chinese Constellation Fenmu, the tomb composed of the upper-left set of his stars). Its importance to several cultures throughout history is of little surprise, as this collection of stars, like the other 11 members of the Zodiac, lies along the ecliptic, the perceived path of the Sun over the course of the year. As of this writing, Aquarius and the waters spilling from his flask separate the planets Jupiter and Neptune (with Jupiter prominent in our night time sky in Capricornus) from Uranus, which lies just on the inside edge of the boundaries of Pisces. Within his borders lie several interesting objects for binocular and telescope viewers alike, including two Messier globular clusters (M2, M72), one Messier open cluster (M73), and two prominent NGC objects. 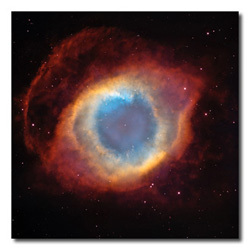 Had the Helix Nebula (NGC 7293, left) been discovered in far more recent times instead of its 1824 origins, its name night instead be the Eye Nebula, a description more in line with the many Hubble and ground-based images generated in the past few years. The full-size image (HERE) is a sight to behold. The Saturn Nebula (right, NGC 7009) makes a nearly straight line with M72 and M73, making this a very dense patch of outstanding objects. Herschel documented its discovery in late 1782, but it took the Hubble telescope to again add to its fame as a beautiful and complex object. While the star connection provided by Starry Night Pro (shown above) is as legit as any other, I found the connection pattern shown at right (from wikipedia) to perhaps be a bit easier to visualize as a human with a large jug, although this view is decidedly of a clumsier water bearer spilling the jug contents ahead of him (below). Someone should tell this version of him to not quit his day job.